Our business is helping companies and professionals achieve their full potential. So, it’s no surprise that we, as an organization, strongly believe in helping others beyond the workplace. We believe it is the responsibility of all individuals to help others; to make a contribution that makes a difference. 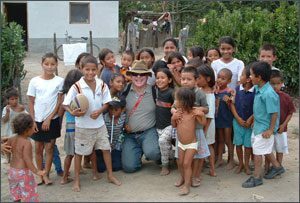 In 1999, a friend asked Darryl Salerno to accompany him on a humanitarian mission to Honduras. He jumped at the opportunity. Darryl enjoys helping those in need, especially when he can make a real difference in their daily lives. After spending a week on a community ranch in rural Honduras, Darryl has been returning, for week-long trips year after year. His group supplies most of the medicine for a year at the clinic and has helped build: two schools; a library; a bridge over the highway for students to cross safely; and a soccer field. In addition, they have worked in the surrounding villages to lay cement floors in the homes and provide clean drinking water to hundreds of families. Darryl Salerno is a founding member of the Founding Fathers, a New York-based group committed to preventing and ending spousal abuse. The organization believes that fathers can play a unique role in battling this often-unreported crime. Darryl Salerno is a member of Heifer International’s Ambassador Council. Heifer International has a unique and successful approach to ending hunger and poverty. It provides impoverished families with food- and income-producing animals as well as environmentally sound agricultural training. This provides a long-term source of food and income for these families, which promotes self-reliance, builds self-esteem, and helps the families lift themselves out of poverty. In return, Heifer International asks that the families share their animals’ offspring with others – along with their knowledge, resources, and skills – to create an expanding network of hope, dignity, and self-reliance throughout the community as a whole. For more information, visit their Web site: http://www.heifer.org/.